Hugh: If all your songs are songs about writing songs, don’t expect anyone to listen to them. Austin: The problem with writing about creativity is that it’s often more lucrative than actually being creative. Austin: God, I can’t wait to start making some actual stupid art again. Both Austin and I have both written books on creativity. Mine did really well so far; I expect Austin’s, when it comes out next month, to become a massive bestseller, if I’m still going to carry on believing that there’s any justice in the world. i.e. I know my stuff, at least on a good day, and Austin DEFINITELY does. Creativity comes after the fact. Kid: How do I get a “creative” career-thing going like yours? Kid: What if it isn’t any good? Kid: Ok, what if it’s pretty good, but it’s still going to take me another twenty or thirty years before the world understands it? Hugh: Then you’re slightly less screwed. The thing is, people think there’s some set of ideal conditions out there, floating independently in space, that somehow have be met, some magic fairy boxes that need to be ticked off, before you can go and “be creative”, whatever that means. Actually, no. The way to be creative is to make stuff. You wake up in the morning, have some breakfast, hit the work bench and get on it with it. Or not. Maybe you’d rather just hang out, light a joint and watch Star Trek reruns. Your call. You can’t plan for creativity. You can only plan to do the work. Whether it ends up being “creative” or not, is decided later. Long after you’ve finished the thing and moved on to something else. That’s a tough and very personal question..Am I creative, what can I create and can I sustain that on a daily basis? At my agency, some are great at copy and can ideate but fail miserably when asked to come up with ideas to launch a new brand. And, it’s tough to understand whether it takes talent or grooming or just exposure! I guess it’s a lot about knocking and listening.. when it sounds right you will know. Until then keep knocking. It seems like everyone I knew in high school moved to Thailand after college for a year, or “took time off” after high school instead of getting right into it. I respect these choices, but I have to wonder if I wasn’t able to flex more creative muscle in the context of diving straight into school and work, and having to find creative solutions to actual problems…instead of waiting around for inspiration. Eventually it led to the kind of job that people ask the same kind of questions about. How did you get there, what did it take, etc. It happened only after I went to work for a while, and that part you just can’t skip. Yeah, I know that choice you faced. I went straight into the workforce… to be honest, I was sick of hanging around so I was glad to do it. Two decades later, I’m kinda wishing I spent more time in Thailand or whatever… but I don;t think that would’ve helped me in the end. I think it’s when you use “travel” as a crutch, well, that has the same drawbacks as when you use anything as a crutch. Because of the choices I made, I’m able to see the world *because* of the work I do now, not at the expense of it. Five years ago, I would have never thought someone would value my work enough to send me around the country, let alone abroad. But I have the best of both worlds, and it’s because of diving right in. It’s just one proof point that I made the right choice…for me. I can’t speak for anyone else. Isn’t it better to spend some years behind the desk and then take some time off (no matter how that tough that is) for Thailand. By know, you will know both the sides and be more open to experiences. After school, it can be fun but I am sure how will come home with you. love both of the exchanges you posted. think at the end of the day, showing up and doing the work is all you can do. can’t stress about if it is good, worth while and or any of those things. all you can do is show up and do it. there is actually no way to really tell someone how to be creative. we all are. what we need to learn is how to get out of our own way and let it out whichever way it wants to come out. nothing more. nothing less. yet sometimes the hardest thing to do. > Kid: What if it isn’t any good? > Hugh: Then you’re screwed. David W. Galenson explained in his book “Old Masters and Young Geniuses” that geniuses are not always those who produce great work when then start. About half of them produce crap, and get better later. The trait of great artists is that they never give up. Beyond just waking up and making stuff, it feels like there’s a road one has to walk, from which creativity comes. Requires either some serious dissatisfaction with the way things are; or desperate search for tonic to drown a wound. What would a perfectly satisfied, well-adjusted creative-type add to the world? “Here’s a picture of why I’m totally on-board with what you guys came up with”! So, you can’t just move to India and have it happen. You have to toil first, and that balance of toiling now for better stuff later is hard. This is all very interesting. A couple of things I’d like to add to the discussion: One is the ability to learn from mistakes. 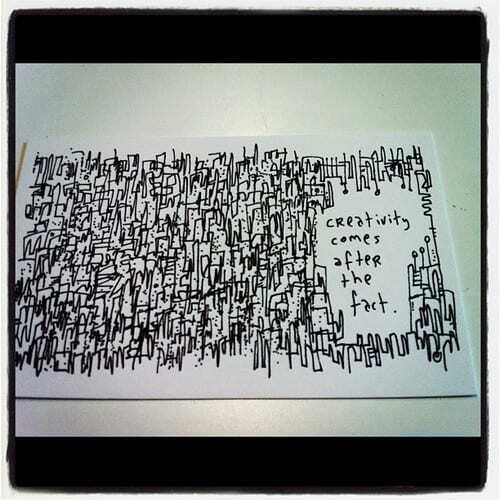 Creatives aren’t afraid to be wrong – their “mistakes” aren’t throw-aways. They’re part of the process. Creative types aren’t easily discouraged. They take risks and therefore make lots of mistakes. They’re bound to hit on something good eventually and a confident creative knows that. Secondly, there’s experience. The broader range of experience one has, the easier it becomes to connect one thing to another. What may seem totally unrelated to the average observer, is so obviously connected in the mind/eye/heart of the creative person. And the older you get, the easier it is to recognize that fact.